If there is a monument or memorial in Paducah not listed below, please contact Public Information Officer Pam Spencer. The 9/11 Memorial is located at the Cairo Road entrance to Noble Park. The inscription is as follows: In honor and remembrance of the heroes and victims of September 11, 2001 and to celebrate the enduring spirit of all Americans. Presented by members of Woodmen of the World Life Insurance Society, September 11, 2002. Paducah Lodge No. 2. The 1937 Flood Monument is located in the median of the 2900 block of Jefferson Street. The monument is inscribed with the following: An expression of gratitude to all who gave aid during the flood of 1937. The historical marker adjacent to the monument reads: The 1937 Flood. The Ohio Valley Flood of 1937 was the greatest natural disaster in the history of the U.S. and drove over one million citizens from their homes. This location marks the water’s western edge in Paducah at the height of the flood, Feb. 2, 1937. Over 90 percent of the city was inundated, 27,000 people were evacuated and damage exceeded $22,000,000. The monument was commissioned by the Jaycees and installed by Beasley Monument Company. It was dedicated June 19, 1938. The eagle at the top of the monument was once on the post office facility at 5th and Broadway. That facility was demolished in 1937. 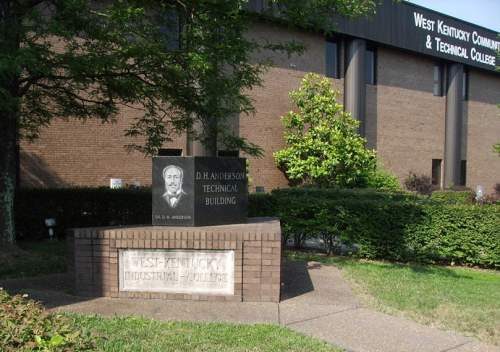 A memorial is located at the entrance of the D.H. Anderson Technical Building on the campus of West Kentucky Community & Technical College (WKCTC). Dr. Anderson (1866-1952) is credited as the founder of West Kentucky Industrial College, a predecessor of WKCTC. The monument was designed by Herbert Martin who chaired the monument committee. It was installed by Dub Beasley with a dedication ceremony held June 8, 1994. A lantern is inscribed on the monument with the following: From this light rode forth an educational vision that still shines brightly today. Anderson believed that education and job training were vital for change for African Americans. A memorial in honor of Alben W. Barkley is located in the lobby of City Hall located at 300 South 5th Street. The inscription on the monument is as follows: Alben W. Barkley Vice President of the United States of America, 1949-1953. Funded by lovers of history and art. Promoted by Lilija Macs Murphy, 1979. The monument was sculpted by Fredda Brilliant F.R.S.A.,F.I.A.L. The memorial to Alben W. Barkley (1877-1956) is located in the median of Jefferson Street at the intersection with Joe Clifton Drive. The inscription on the memorial reads: I would rather be a servant in the house of the Lord than to sit in the seats of the mighty. The memorial was sponsored by the Paducah Junior Chamber of Commerce and the Kentucky State Federation of Labor. Barkley served as vice president of the United States from 1949 to 1953. He was popularly known as the “Veep.” The monument was dedicated April 14, 1957. It was manufactured by Rock of Ages and installed by Paducah Granite, Marble & Stone. The monument originally was planned for U.S. 45 and Blandville Road. The Blue Star Memorial marker is located in the 100 block of Broadway adjacent to the gazebo located at 2nd Street and Broadway. The inscription on the marker reads: Blue Star Memorial. A tribute to the Armed Forces that have defended the United States of America. Sponsored by The Garden Clubs of Paducah in cooperation with The Garden Club of Kentucky, Inc. Member of National Council of State Garden Clubs, Inc. The Carnegie Library Memorial is located in the median of the 2400 block of Jefferson Street. The marker adjacent to the memorial reads: This memorial stood in front of the Carnegie Library at 9th & Broadway from 1915 to 1970 when the building was razed following a fire. This memorial was dismantled and stored on the property of Judge David R. Reed, Jr. Later Dr. Ronald L. Kelley owned the property and in 1994 he and his wife, Molly, donated these stones to the City of Paducah to preserve a part of our heritage. This memorial was re-assembled here in 1994 through the efforts of H. Eugene Katterjohn, Jr., Gus E. Hank III and Walter L. Beasley, Jr. The monument pays tribute to Oscar Turner. The monument was erected by Billy Turner Abram in memory of her father, Oscar Turner, who loved the people of the First District whom he represented many years in Congress. Also inscribed is the following: 1825-1896 Oscar Turner. He was born in New Orleans and move to Ballard County, KY in 1843. He was graduated from Transylvania University in 1847 for the practice of law. In 1851 he was elected Commonwealth attorney and in 1867 he was elected to the state senate serving four years. In 1878 he was elected to Congress, re-elected in 1880 and again in 1882. He secured many substantial appropriations for the first district including $150,000 for a U.S. Customs house and post office for Paducah at Fifth and Broadway in 1882. A monument to honor Julian M. Carroll is located in the lobby of City Hall located at 300 South 5th Street. The inscription on the monument is as follows: Governor of the Commonwealth of Kentucky, December 1974 to December 1979. Funded by lovers of history and art. Promoted by Lilija Macs Murphy, 1979. The monument was sculpted by Fredda Brilliant F.R.S.A.,F.I.A.L. The statue in honor of Chief Paduke is located in the median of Jefferson near 19th Street. The original location of the statue was 5th and Broadway. It was furnished by the Paducah DAR chapter in 1909. The dedication ceremony was May 19, 1909. The monument was moved to its Jefferson Street location in 1937. The historical marker adjacent to the statue reads: Chief Paduke. Chief of sub-tribe of Chickasaw Indians, who lived and hunted in this area until Jackson Purchase, 1818. Land here then owned by Gen. William Clark, who founded Paducah; named it in honor of the friendly chief. Statue sculptured by Lorado Taft, 1909, who combined features of the various Indian tribes in its execution. Marker sponsored by Junior Chamber of Commerce. The garden which contains benches, a marker, and several varieties of Dogwood trees is located across from tennis courts at Noble Park. 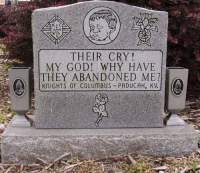 The Paducah Civic Beautification Board dedicated the memorial in 1996 in memory of the 19 children who lost their lives in the Oklahoma City bombings. The Garden Clubs of Noble Park, the Civic Beautification Board, La Petite Garden Club, and several individuals contributed funds for the purchase of new dogwoods and shrubs. The garden originally was located next to the Amphitheatre. Irvin S. Cobb (1876-1944) is buried at Oak Grove Cemetery. The marker adjacent to his grave reads: Native of Paducah, famed wit and humorist; newspaper reporter, war correspondent and feature writer; author of books, short stories, movie scripts and plays. Started career with local paper. Moved to New York, 1904, to Hollywood, 1934. Beloved, especially for his high tribute to Kentucky's proud folk in his writing and speeches. Marker presented by Paducah Retail Merchants Association. The “Duke of Paducah” marker is located on the 600 block of Broadway. The inscription on the marker reads: Irvin Shrewsbury Cobb, 1876-1944. One of Paducah’s famous sons. “A first-class humorist from a conversational gesture to a book wit who made all the world laugh with him.” Author of more than sixty books, short story writer, recipient of O’Henry Award, movie actor, lecturer. Chevalier of the Legion of Honor, France 1918. Presented 1965 by Paducah Rotary Club. 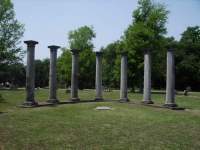 Mount Kenton Cemetery, located at 2535 Lone Oak Road, has a monument consisting of seven columns and a plaque that reads These columns are from the old federal building in Paducah and completed in 1885. Demolished in 1937, Stored at Mt. Kenton until 1989 when erected by cemetery through courtesy of Reynolds Monument Co. The building was located at 5th and Broadway. The Confederate Monument with the graves of six Confederate soldiers is located in Oak Grove Cemetery. It is located in the Old Addition, Section AA, Lot 11 (near the intersection of Charity Avenue and Oak Street). The monument was built in 1907 on behalf of the United Daughters of the Confederacy. The monument is a 20-foot-tall granite obelisk. Six Confederate war dead are buried by the monument (John Bowles; George Daugherty; Charles Loftland; J.B. McManus; M. William Stanley; and T.A. Thornton). A step, inscribed with Confederate Rest, constitutes the entryway to the monument. The Memorial is simply inscribed: Our Confederate Dead 1861 – 1865. On July 17, 1997, it was one of sixty-one Civil War monuments in Kentucky placed on the National Register of Historic Places, as part of the Civil War Monuments of Kentucky Multiple Property Submission. The General Lloyd Tilghman statue also is on the list. The marker for the First Confederate Volunteer from Paducah is embedded in the sidewalk on Broadway on the northwest corner adjacent to North 8th Street. The marker reads: Adolphus Owen, killed in the Battle of the Wilderness, left here May 27, 1861, as the First Confederate Volunteer From Paducah. The Desert Storm Memorial is located in the median of the 200 block of Walter Jetton Boulevard at the intersection with Washington Street. The inscription reads: Desert Storm Memorial, Dedicated to those who served. Jan. 17-Feb. 27, 1991. Sponsored by the Civic Beautification Board and Citizens of Paducah. June 29, 1991. Monument donated by Page Enterprises, Inc. The one square city block, Dolly McNutt Memorial Plaza, is located at 301 South 5th Street between City Hall and the McCracken County Courthouse. The plaza, formerly known as the City Plaza, was renamed Dolly McNutt Plaza in May 1986 to honor former Mayor Dolly McNutt. In November 2013, the Paducah Board of Commissioners changed the name to Dolly McNutt Memorial Plaza to recognize the memorials in the plaza. The memorials recognize veterans who served in World War II, the Korean War, the Vietnam War, and the Global War on Terrorism. The historical marker reads: Dolly McNutt Plaza - Named for the Honorable Alice (Dolly) McNutt. Member Kentucky House of Representatives, 1976-86; Mayor City of Paducah, 1972-76; City Commissioner, 1968-70. Renowned for her outstanding ability as a public speaker. Respected for her high standard of excellence and brilliant record. Loved for her contribution of time, talent and service to all Kentuckians. (Resolution adopted by Mayor Joe Viterisi, City Commissioners P.J. Grumley, Hal Cole, Robert Coleman, Harold Ford, May 13, 1986). A monument to honor Almyr Sherrell Edwards (1872-1892) is located in Caldwell Park at 1401 Park Avenue. This monument is often called the Soldier Boy monument. Private Edwards of Company C, 3rd Regiment Kentucky State Guard died July 13, 1892 while on active duty. His unit was activated at the request of the mayor of Paducah in response to a riot by an armed group of citizens intent on freeing a suspect from the local jail. The inscription reads: The rolling seasons pass away, and Time, untiring, waves his wing; Whilst honour’s laurels ne’er decay, But bloom in fresh, unfading spring. And thus this man died, leaving his death for an example of a noble courage, and a memorial of virtue, not only unto young men, but unto all his nation. Responding to the call of his state and in the enforcement of her laws, he met a soldier’s death. As a tribute to his memory and to perpetuate his name, this monument has been erected by the citizens of Paducah. A historical marker is located at 100 Broadway on the river sign of the floodwall giving a brief history of the Federal occupation of Paducah during the Civil War. The marker includes the proclamation issued by Brigadier General U.S. grant when he came ashore in Paducah in 1861. To read the entire text of the marker visit Federal Occupation of Paducah marker text. Visit Paducah's thriving riverfront and take a self-guided tour of the Paducah Wall to Wall Mural along the concrete floodwall in downtown. These works of art depict Paducah's rich history in more than 50 life-sized panoramic murals by renowned artist Robert Dafford and the Dafford Murals Team. Informational plaques are associated with each mural providing additional details about Paducah's history. In front of the Julian Carroll Convention Center is a grassy area with historical markers regarding Fort Anderson. The inscription on the Fort Anderson marker is as follows: Union fortification built 1861 and named for Kentuckian Robt. Anderson of Fort Sumter fame. Led by Gen. N.B. Forrest, CSA forces attached fort on March 25, 1864, seized supplies, and burned wharf. CSA Col Albert Thompson of Paducah killed. Next day USA troops under Col. S.G. Hicks burned homes to clear area of cover for Confederate soldiers. The inscription on the Grant’s Proclamation marker is as follows: On this spot, September 6, 1861, Gen. U.S. Grant read proclamation to citizens of Paducah announcing that the Union Army was taking possession of town “to defend you” against Confederate attack. The “enemy” had taken “possession of and planted his guns” at Columbus and Hickman on the Mississippi. Union troops moved in and the U.S. occupied city for duration of war. There also are two markers in honor of Col. Albert P. Thompson in addition to a marker paying tribute to the 8th U.S. Colored Heavy Artillery. The Artillery helped repulse the assault by Confederate troops which attacked Fort Anderson on March 25, 1864. On August 7, 2017, the Clarence 'Big House' Gaines monument was unveiled at Robert Coleman Park. The monument was designed to reflect Gaines' monumental contributions as a coach, leader, athlete, and humanitarian and to display his many accolades as an inspiration for generations to come. Gaines (1923-2005), a Paducah native, was inducted into the Basketball Hall of Fame in 1982 and the College Basketball Hall of Fame in 2006. He was the first African American caoch inducted into the Basketball Hall of Fame. On a related note, the NAACP began spearheading an action in 2014 to rename South 7th Street to Clarence 'Big House' Gaines Avenue in his honor. His family expressed a preference for South 7th because of its rich history regarding African American business and commerce including the nearby Hotel Metropolitan which Gaines owned for years. The street was renamed in 2015. On Memorial Day, May 28, 2018, members of the Operation Enduring Freedom Fund held an unveiling ceremony for the Global War on Terrorism Memorial. The Memorial, which honors those who have fought the global war on terror, is located on the Clark Street side of Dolly McNutt Memorial Plaza. Nathan Torian organized the campaign to raise the funds to build the Global War on Terrorism Memorial to honor those who lost their lives serving our country. Torian’s brother, MSGT. Aaron C. Torian, was killed February 15, 2014, while conducting operations in Afghanistan. Torian’s high school friend, Marine Sgt. Christopher T. Heflin, was killed November 16, 2004, in Iraq. In 2017, the Paducah Board of Commissioners approved the placement of the Memorial in Dolly McNutt Memorial Plaza, a City park. In 2014, the Board approved a $15,000 contribution to the Memorial’s construction. McCracken County also contributed $15,000 toward the construction. The inscription reads, The events of September 11, 2001 ignited a call to unify against those who would threaten our freedom and way of life. This memorial honors those who served, fought, and laid down their lives during the global war on terrorism. The Clyde W. Greenway Memorial Fountain is located in the median of the 200 block of Fountain Avenue near the intersection with Broadway. It was dedicated by the Paducah Civic Beautification Board in 1973. Greenway served as the chairperson for Sears-Roebuck HANDS (Home and Neighborhood Development Sponsors) Award given to the Paducah Civic Beautification Board on May 25, 1973. Paducah received the award for the work by the Garden Clubs of Paducah for conservation and beautification of the city. Paducah has dozens of historical markers. To see a listing visit the Kentucky Historical Society’s Historical Marker Database. Select McCracken County. The Horse Watering Fountain Monument is located in the median of the 100 block of Walter Jetton Boulevard. The 1907 monument was presented by the National Humane Alliance, Hermon Lee Ensign, founder. The marker in front of the monument reads: This horse watering fountain moved by Beasley Monument Co. 15 feet southward from a former location June 1, 1979 at the direction of H. Eugene Katterjohn, Jr. This marker placed September 1993. Paducah was chosen for the fountain by Fred Tilghman, a trustee of Hermon Ensign and a son of General Lloyd Tilghman. The monument was manufactured by Bedwell Granite Co., Vinal Haven, NH. It is constructed of Maine granite. 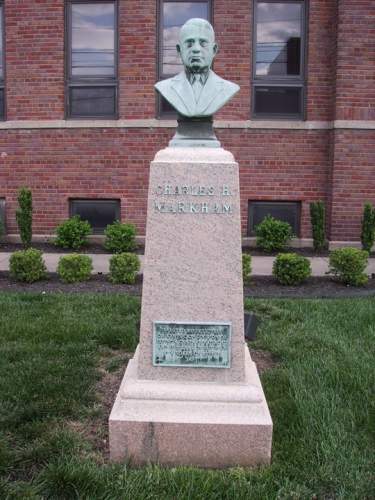 A bronze bust of Charles H. Markham is located in front of the brick building at 1580 Kentucky Avenue. Markham served as the president of the Illinois Central Railroad from 1911-1918 and 1919-1927. Charles A. Peabody served from 1918-1919. Markham dedicated the new shop in 1927. Plaque reads Erected by employees of Kentucky Division of Illinois Central Railroad and citizens of Paducah as a token of esteem. 1927. There also are two monument discs. One shows the railroad’s lines stretching from the Great Lakes to the Gulf of Mexico while the other reads 1851-1951, Illinois Central for 100 years Main Line of Mid-America. The Iron Horse Memorial is located on Water Street near the intersection with Kentucky Avenue. A nearby marker reads: This Mikado-type steam locomotive is dedicated to Illinois Central men and women, past and present, and to the importance of the railroad to Paducah’s history and commerce. No. 1518 is the last Iron Horse owned by the ICRR. Engines built or rebuilt in the Paducah shops many years until 1960, play prominent role in the age of steam. Iron Horse Memorial-Locomotive donated by Illinois Central Railroad. Maintenance funds provided under leadership of the Western Kentucky AFL-CIO Area Council. No. 1518 was moved from Barkley Park to its present site in 1985 when sponsored by city-county government and community action. The baggage car and caboose added at that time. A marker in front of the locomotive reads: To perpetuate memories of the days of the steam locomotive. This engine was presented to the City of Paducah in 1963 by the Illinois Central Railroad Co. For future maintenance the people of West Kentucky contributed to a trust fund sponsored by the Western Kentucky AFL-CIO Area Council. This marker donated by Beasley Monument Co. and Paducah Granite Co. The Jefferson Davis Memorial Highway monument is located in the median of Fountain Avenue at the intersection with Jefferson Street. The simple inscription reads: Jefferson Davis Highway U.D.C. 1935 L. The Jefferson Davis Memorial Highway was a planned transcontinental highway to honor Jefferson Davis, the President of the Confederate States of America. In 1913 the United Daughters of the Confederacy (U.D.C.) planned the formation of the highway which would start in Washington, D.C. and travel through the southern states until its terminus at San Diego. In addition to the planned transcontinental route, they also designated an auxiliary route running from Kentucky to Mississippi, as well as another that ran through Georgia. The Paducah marker is along an auxillary route to commemorate Davis’ birthplace. Along U.S. 68, from Bowling Green, Kentucky, this branch meandered through Russelville, Fairview (Davis' birthplace), Hopkinsville, Cadiz, Benton, then to Paducah where the route took an "L" shape turn and followed U.S. 45 to Mayfield. The Jetton memorial designed by W.L. Beasley is located in the median of Walter Jetton Boulevard at Kentucky Avenue. The inscription reads: Jetton. This tribute is dedicated to the memory of Walter C. Jetton, principal of Augusta Tilghman High School thirty-three years (1922-1955) and of Paducah Tilghman High School two years (1956-1957). He was educator, administrator, scholar, counselor and author. He understood teenagers and maintained uncompromising discipline, being firm, frank, and fair. He even-handedly enforced the rules of the school. His insistence on excellence in every facet of high school education gave Tilghman its state-wide reputation during all those years. He pointed many students into successful careers. He had a good memory and a great sense of humor. In travelling with sports teams, he was one of the guys. Walter C. Jetton 1886-1880. In 2003 his alumni erected this memorial that generations yet unborn may know how highly he was respected by his graduates. A memorial to honor Korean War veterans is located at Dolly McNutt Memorial Plaza located at 301 South 5th Street. The memorial is on 6th Street between Clark and Washington Streets. A sidewalk, benches, and landscaping surround the monument. The memorial consists of black granite and three columns. The monument is 10 feet high and nearly 12 feet in length and includes a bronze medallion for each service branch, a map of the Korean Peninsula, and a relief sculpture made of bronze showing a collage of images reflecting the Korean War. On the bottom of the monument are the words "Not Forgotten." A timeline of the war is outlined on the back of the monument. The memorial was dedicated on Memorial Day, May 28, 2012. For more information, visit Korean War Memorial. The Lewis and Clark memorial is located on the lawn of the National Quilt Museum of the United States located at 215 Jefferson Street. It was installed in 2006. The plaque in front of the statues reads: On the Trail of Discovery by George Lundeen. As Meriwether Lewis and William Clark wound their way westward, they encountered many indigenous people. The Native Americans portrayed here represent those who helped Lewis and Clark during their travels to the Pacific Ocean. The flag that the child is holding and the Thomas Jefferson medal were gifts given to those original people of America. Taking artistic license, George Lundeen added Sacagawea coins to the ears of the Native American and Paducah to the map held by William Clark. It is interesting to note that in 1803, Meriwether Lewis paid $20.00 for his Newfoundland dog, Seaman, but in 1827, William Clark paid only a $5.00 transfer fee for the land where Paducah and McCracken County now stand. Funding for the On the Trail of Discovery was provided by Bill and Meredith Schroeder, founders of the Museum of the American Quilter’s Society. A nearby historical marker reads: Lewis and Clark in Kentucky, McCracken County. Lewis and Clark, with the nucleus of the Corps of Discovery, stayed in present McCracken Co. in Nov. 1803 while traveling down the Ohio River on their journey to the Pacifici. Clark returned in 1827 to establish Paducah. McCracken County, Nov. 11-13, 1803, Lewis and Clark stopped at Ft. Massac, Ill., near present-day Paducah and recruited men, including Indian interpreter George Drouillard. On Nov. 13, they camped in area of Metropolis Lake State Nature Preserve. The Martin Luther King, Jr. monument is located in the 1900 block of Martin Luther King, Jr. Drive. The monument includes a photo of King. The inscription is as follows: King Drive. In honor of Martin Luther King, Jr. Atlanta Jan 15, 1929. Memphis Apr 4, 1968. Dedicated by Paducah Branch of National Association for the Advancement of Colored People Jan 18, 1993. In 2005, the Noble Park Amphitheatre was renovated to include columns from the Immanuel Baptist Church building. The church facility was located at 408 Walter Jetton Boulevard (10th Street). It has since been demolished. The new amphitheatre was designed by Peck, Flannery, Gream, Warren with a dedication ceremony held October 16, 2005. The monument to honor Paducah-McCracken County police officers killed in the line of duty is located on the lawn of the McCracken County Courthouse on the 7th Street side near Clark Street. The front of the monument is inscribed with the following: Memorial to police officer killed in the line of duty Paducah-McCracken County. William Romain August 12, 1917, Paducah Police Dept. Calvin C. Smith October 3, 1893, Paducah Police Dept. William H. Poore November 29, 1928, Paducah Police Dept. Jackson Purchase Fraternal Order of Police Lodge No. 15. On the back of the monument the inscription reads: This monument is dedicated to the men and women who serve their communities every hour of every day as law enforcement officers and to those who gave the ultimate sacrifice. At Oak Grove Cemetery is the grave of John T. Scopes (1900-1970). There is a historic marker located on Park Avenue near the cemetery entrance. The marker reads: Grave of John T. Scopes. Here is buried the man who, at age 24, taught Darwin's theory of evolution to a Dayton, Tennessee, biology class. The Paducah native and University of Kentucky graduate violated a Tennessee law forbidding the teaching of evolution. This test case, tried in Dayton, gained international attention. Popular play, "Inherit the Wind," is based on the famous Scope trial. The July 1925 trial of John T. Scopes had at issue academic freedom, separation of church and state, and reconciling of science and religion. Scope's defender was Clarence Darrow: his prosecutor, William Jennings Bryan. Scopes was convicted and fined $100. Later worked as geologist in S. America and La. Law he violated repealed in 1967. Scopes died, 1970. The Spanish-American War Memorial is located near the McCracken County Courthouse on Washington Street just east of 7th Street. The inscription on the memorial reads: You triumphed over obstacles which would have overcome men less brave and determined." President McKinley 458,151 Erected in Honor of The Veterans of the Spanish-American War by the Department of Kentucky United Spanish War Veterans and Auxillaries. June 1, 1941. The Lloyd Tilghman House & Civil War Museum is located at 631 Kentucky Avenue. The 1852 Greek Revival home owned by Sons of Confederate Veterans was once the residence of Gen. Lloyd Tilghman, CSA. Exhibits highlight Western Kentucky's role in the War Between the States. The museum is open April through November and by appointment throughout the year. Contact the museum at 270-575-5477 for admission prices and hours of operation. The statue is located at Lang Park (also known as Circle Park) at 350 Fountain Avenue. The statue’s inscription reads Brigadier General Lloyd Tilghman killed at the battle of Champions Hill, Miss, May 16, 1863. To the faithful sons of the Confederate States of America who gave all to uphold Constitutional liberty and states rights. The historical marker near the statue reads Gen. Lloyd Tilghman. Heroic statue of the Confederate erected in 1909 by his sons and United Daughters of the Confederacy. Born in Maryland. Chief engineer 1855-56, New Orleans and Jackson Railroad, first to enter Paducah. Joined Confederates July 5, 1861. Killed in battle near Vicksburg, Miss. May 16, 1863. Sculptor was Henry H. Kitson of Boston, Mass. Marker presented by Tilghman Class of 1929. On July 17, 1997, it was one of sixty-one Civil War monuments in Kentucky placed on the National Register of Historic Places, as part of the Civil War Monuments of Kentucky Multiple Property Submission. The Confederate Monument also is on the list. A monument is located in front of Fire Station #4 at 3189 Jackson Street. The monument is a celebration of Paducah's centennial, but it also contains a time capsule to be opened at Paducah’s bicentennial, 2056. The time capsule contains an Elvis record, soft drinks, a Tilghman dedication program, a half-dollar, church programs, driver’s licenses, Bible, September 7, 1956 Paducah Sun Democrat, and a sealed envelope from Mrs. Henry Leonard. 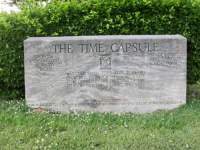 The time capsule was dedicated September 8, 1956. 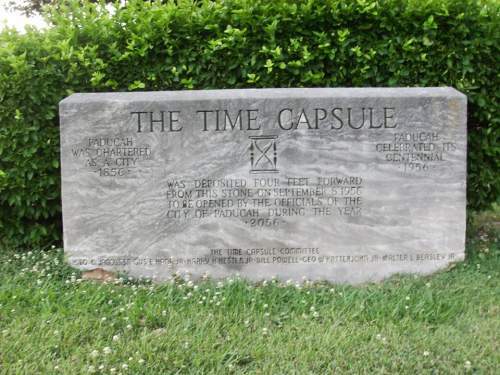 Inscribed on the monument is the following: The Time Capsule was deposited four feet forward from this stone on September 8, 1956 to be opened by the officials of the City of Paducah during the year 2056. Paducah was chartered as a city-1856. Paducah celebrated its centennial-1956. The Time Capsule Committee: Geo. Jacobs Sr., Gus E. Hank Jr., Harry H. Hester, Jr., Bill Powell, Geo. W. Katterjohn, Jr. Walter L Beasley, Jr. The Veterans Memorial is located on the lawn of the McCracken County Courthouse on the Washington Street side. The memorial is inscribed with the following: United we stand, divided we fall. To all servicemen and women who faithfully served their country with honor. On the memorial are the seals of five branches of the military: Army, Navy, Air Force, Marine Corps, and U.S. Coast Guard. The memorial was dedicated May 25, 1992. The Vietnam Veterans memorial is located at Dolly McNutt Memorial Plaza at 301 South 5th Street. The monument is on the Washington Street side of the plaza facing the McCracken County Public Library. The monument is inscribed with the following: Proudly dedicated to the Kentuckians who faithfully served their country in Vietnam. Bless them all. At the base of the monument is a listing of 46 men from the Purchase Area who lost their lives in Vietnam. Click Purchase Area Vietnam Veterans to see a photo of the listing. The memorial was dedicated on Memorial Day in 1984 by 15 members of the Vietnam Veterans group of Paducah. Wacinton was hand-chiseled by Peter "Wolf" Toth from a local 56,000 pound red oak. It honors the Chickasaw Indians who lived and hunted in this area until the Jackson Purchase in 1818. The sculpture was dedicated May 26, 1985. It is located on Park Avenue next to the tennis courts and the Robert Cherry Civic Center. Wacinton means "to have understanding." The Mayor at the time of dedication was Joe Viterisi with Commissioners PJ Grumley, Harold Ford, Robert Coleman, and Hal Cole. In November 2015, a portion of the headdress fell off of the sculpture due to interior rot. Toth spent the summer of 2016 stabilizing the structure and freshening its features. To give it strength, a telephone pole and a wooden framework were installed inside the sculpture. 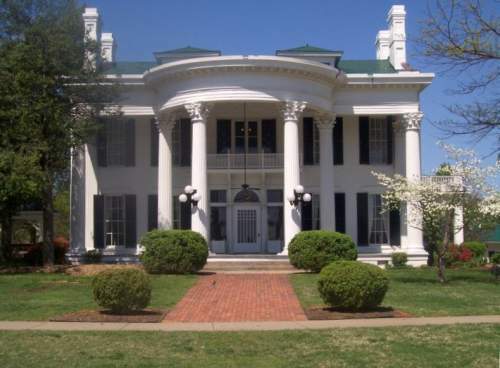 The Whitehaven Welcome Center, located at 1845 Lone Oak Road off Interstate-24 Exit 7, is a restored 1860s mansion. The beautiful welcome center features period furnishings and memorabilia of Paducah native Alben Barkley, who served as Vice President under Harry Truman. Whitehaven is a Classical Revival residential structure and the only historic home in Kentucky serving as an interstate Welcome Center. Lobby is open 24 hours for the traveling public with vending machines and restrooms. Free tours are available. For more information call 270-554-2077. The World War I memorial is located in Oak Grove Cemetery. The monument was erected and dedicated in 1928 by Paduke Post 31 of the American Legion. The bronze monument with a granite base was designed by sculptor John Paulding, cast by the American Bronze Company, and erected by the Beasley Monument Company. The inscription on the front of the monument reads: 1928, Erected and dedicated by the American Legion to our comrades of the World War who sleep the long sleep. One of the monument’s sides has the inscription: When to the last assault our bugles blow: reckless of pain and peril we shall go. Heads high and hearts aflame and bayonets bare, and we shall brave eternity as though eyes looked on us in which we would seem fair. The other two sides of the monument recognize the Paducah Mayor, City Commissioners, McCracken County Judge, and County Commissioners. The World War II Memorial is located at Dolly McNutt Memorial Plaza, 301 South 5th Street. The memorial is on South 5th Street between Clark and Washington Streets facing City Hall. On the memorial is the inscription, Dedicated to the military veterans who served our county in war and in peace. To protect and preserve our freedom. A nation conceived in liberty and justice. November 9, 2007. A small memorial is located in the median of the 400 block of West Jefferson. The memorial is in the shape of a podium with an open book on top with the inscription: Dedicated to those in McCracken County who served their country in World War II.